There was a young boy who knocked on a door to ask if he could have some food but the old woman who answered said she didn’t have any food. So the boy asked if she had a stone. The woman told him there were stones in the street. 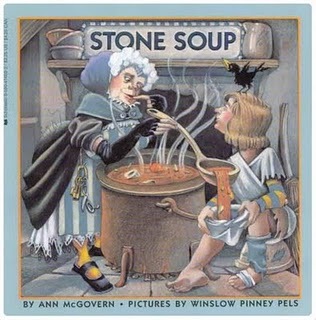 He told her he could make stone soup if she had a pot. The woman put water in the pot and put it on the fire. The boy put the stone in and than waited for it to boil. Than he told her it would taste better if she had an onion, so the old lady went and got a yellow onion from her garden. Then the woman said “This soup smells good” so the boy said it would smell even better if we had carrots. So the lady went to her garden and got as many carrots as she could carry. Then she said “This soup is fit for a prince” and the boy said it would be fit for a king if we had a beef bone. Than the lady went outside and got a juicy beef bone. Than she tasted it and said “This is good soup” but the boy said it would be better if we had some salt and pepper. So she got some pepper and salt and than said “this soup is too thin” so the boy said they needed some butter and barley. So she went and put that into the pot. Than the boy said it was ready to eat. So the woman set up a table with a tablecloth and dishes. So they ate the soup and than the boy took the stone out of the pot and put it in his pocket. The woman asked why he took the stone and he said because it needed to cook more tomorrow. So he walked and walked down the road some more. A boy who was hungry found a house and knocked on the door, it was a little old lady. The boy asked for food and the old women closed the door. The boy then asked for a stone to make soup. The boy then suggested more ingredients to make the soup just right and the little old women added them. She then said to the boy that the soup was fit for a king and the two ate the soup. The boy then took the stone, and the woman asked why he was taking the stone. The boy said that the stone still had some boiling left and walked away. The boy was very clever when trying to get food. It’s about a kid that is very hungry, and he wonts some food. So he tricks the lady into ginving him some food. And at the end they were happy and they got all of the soop they wamted.